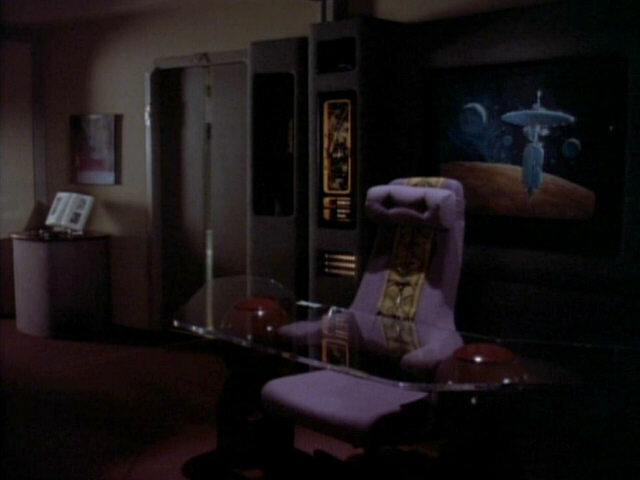 Ex Astris Scientia - Observations in TNG: "Chain of Command I"
Here are some observations about sets, props and visual effects in TNG: "Chain of Command I" without a specific theme, and a comparison of the original TV release (TNG) with the remastered episode (TNG-R). 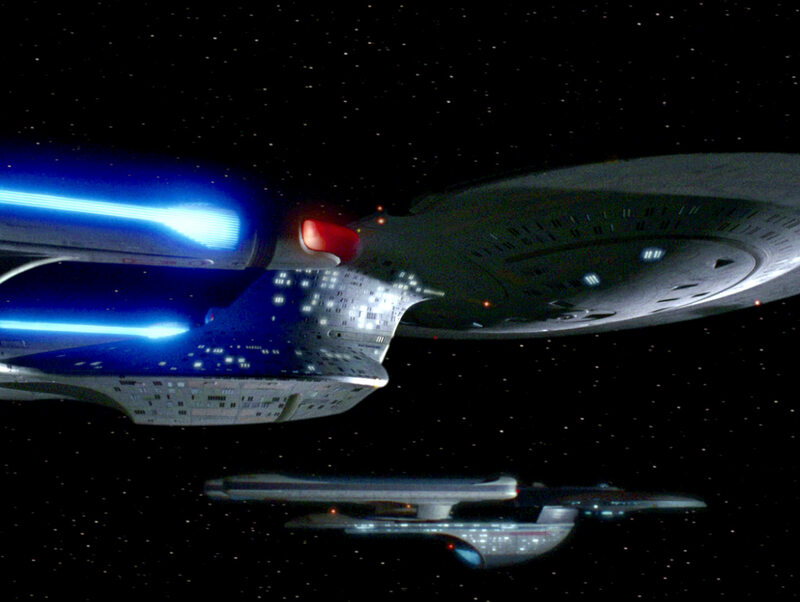 The two shots of the Excelsior-class ship USS Cairo were originally created for earlier season 1 and 2 episodes. 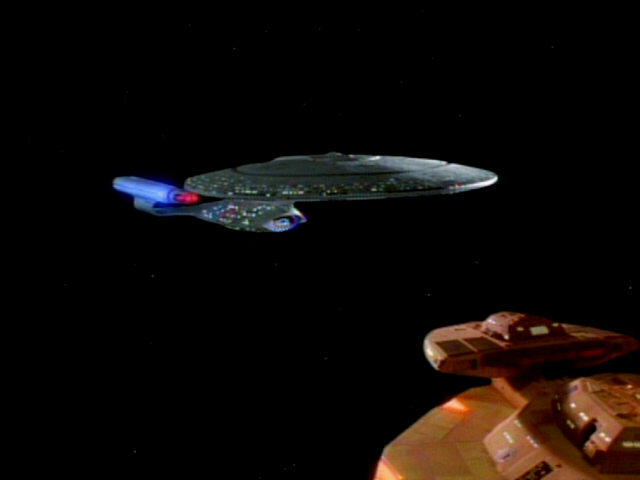 The first shot first appeared in "The Child" and the second shot was created for "Encounter at Farpoint". 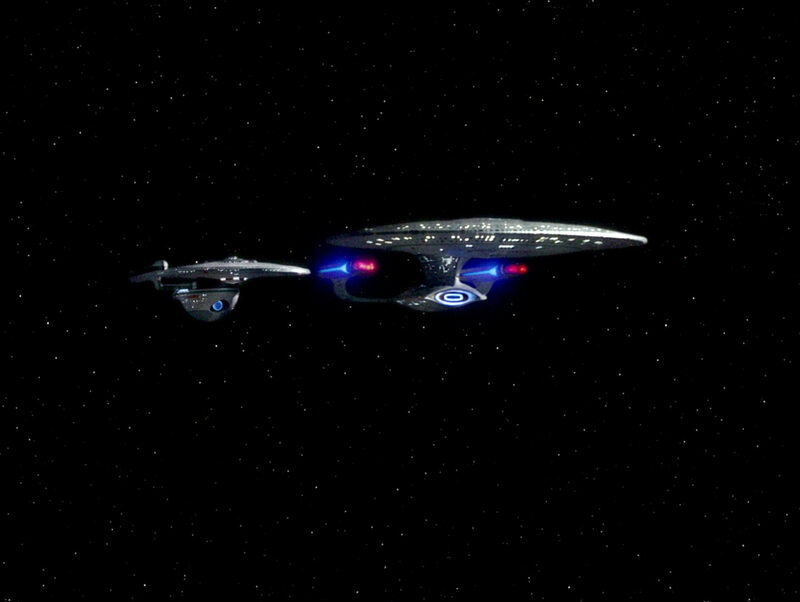 A look at the two ships in HD. 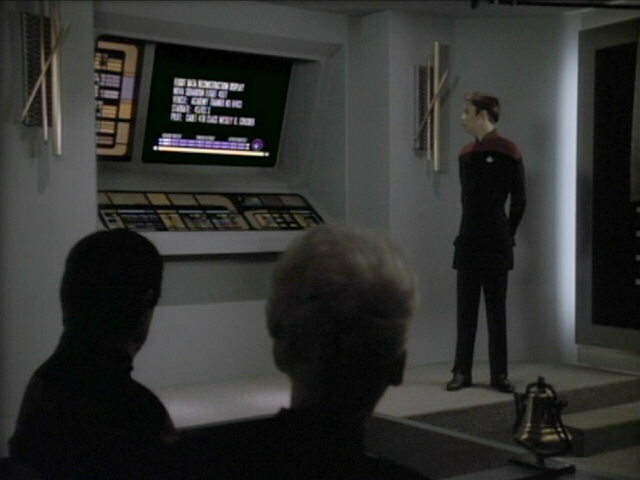 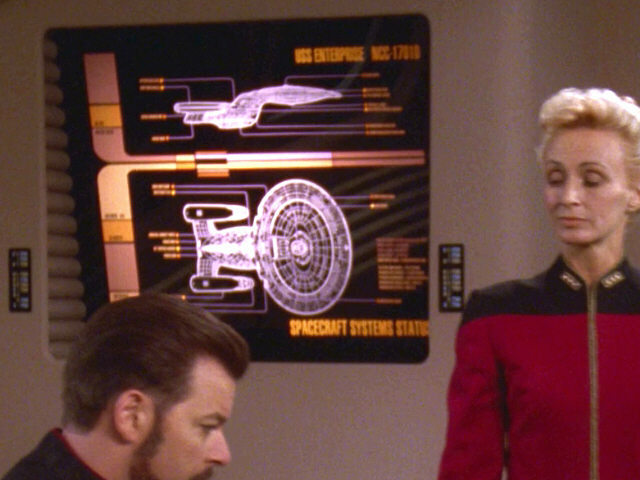 Beginning in this episode, the observation lounge monitors display two LCARS graphics. 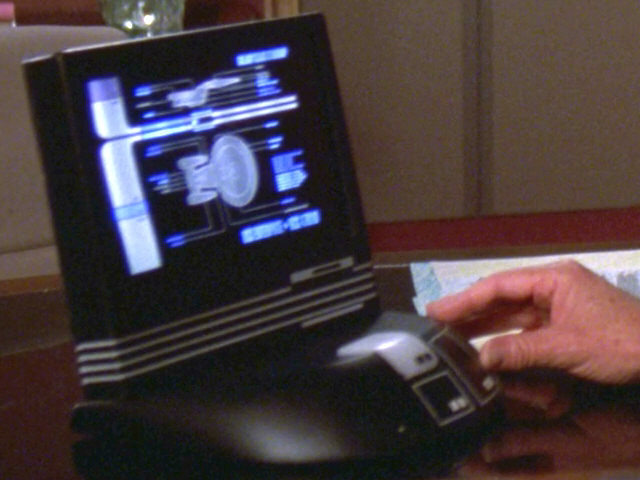 The monitor seen behind Admiral Nechayev displays a side and top view of the USS Enterprise-D. A close-up of the graphic in HD. 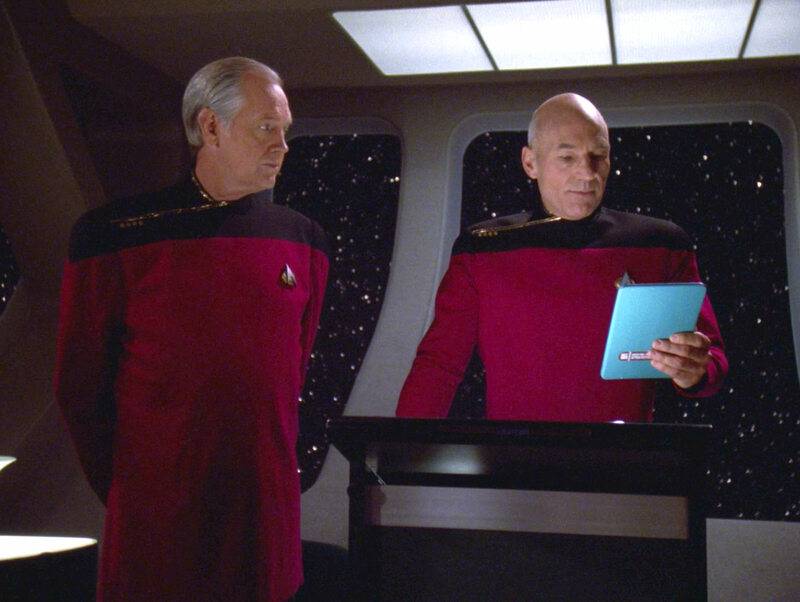 Picard reads from a blue PADD in this shot. 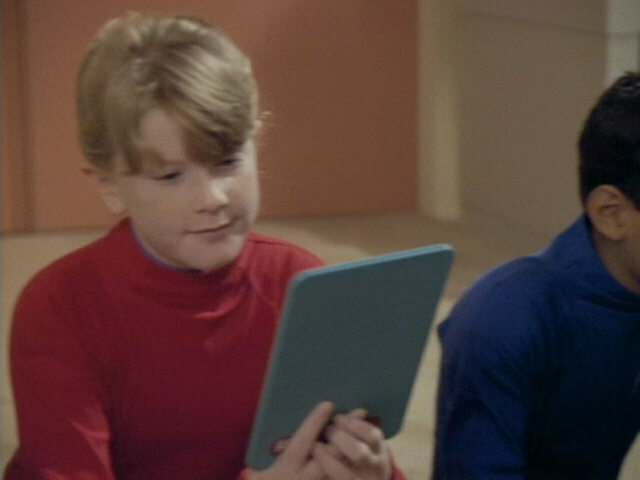 Blue PADDs first appeared in "Hero Worship", in use in classrooms. 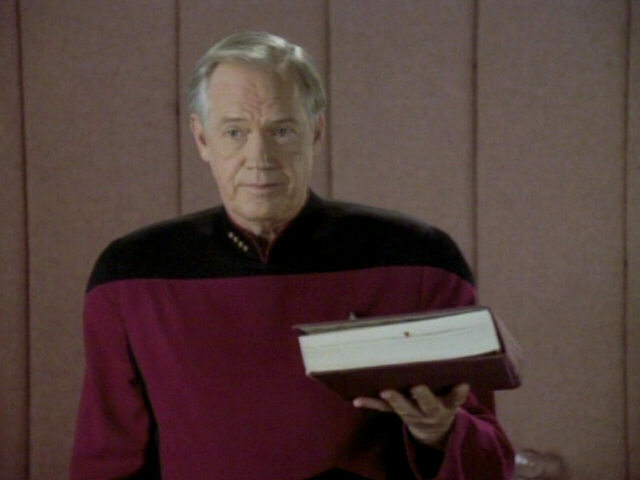 Beginning with "Ethics", they were also used by medical practitioners. 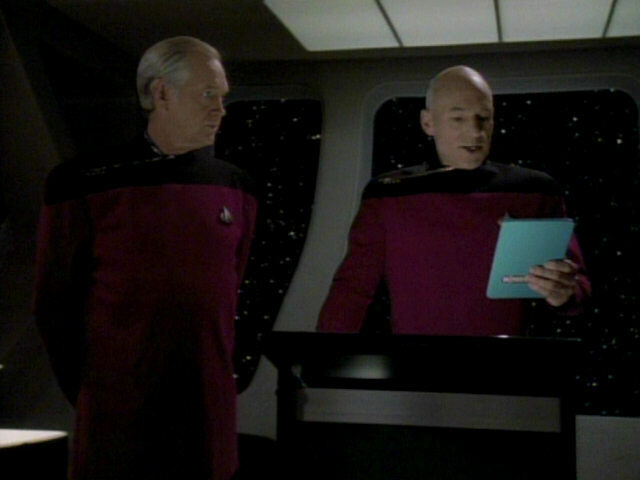 "Chain of Command I" marks the first appearance of such a PADD in a non-educational or medical context. 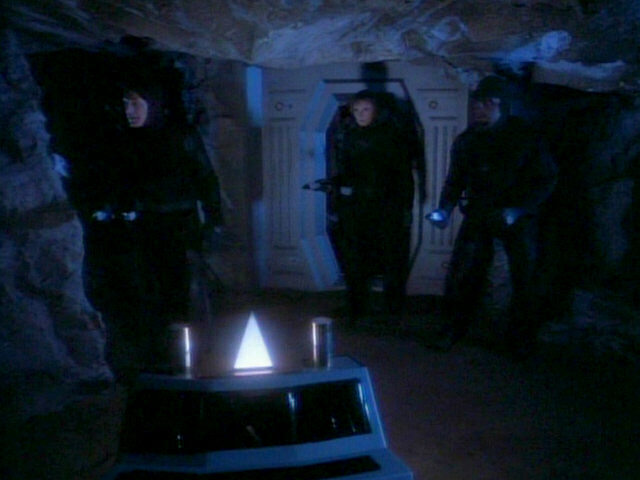 "Hero Worship" The blue PADD in HD. Ever since "Schisms", the graphic showing subspace signals has been on display on this aft bridge station monitor. 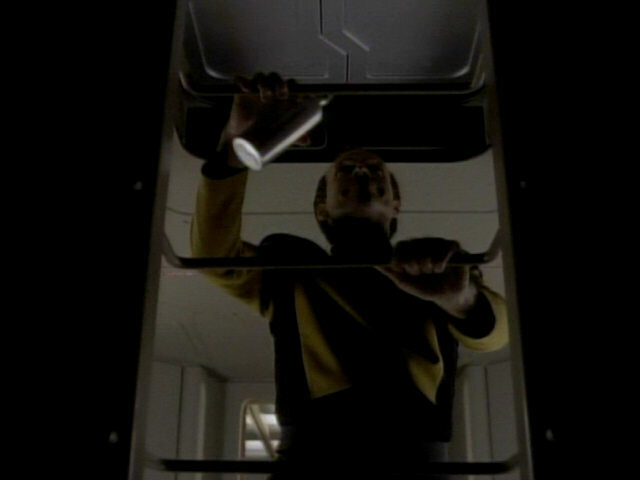 While Barclay has first been seen going up one level from the main engineering Jefferies tube access, Captain Jellico is first seen going one level down here. 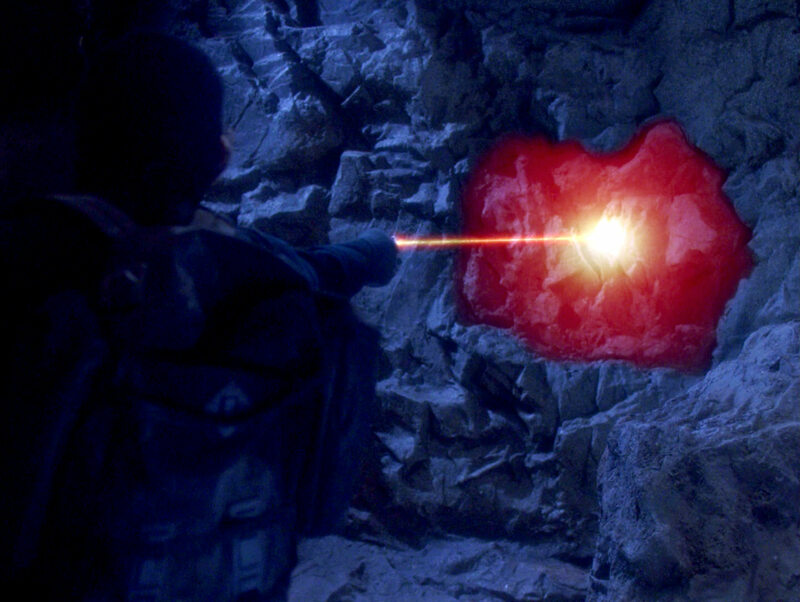 "Realm of Fear" The shot in HD. 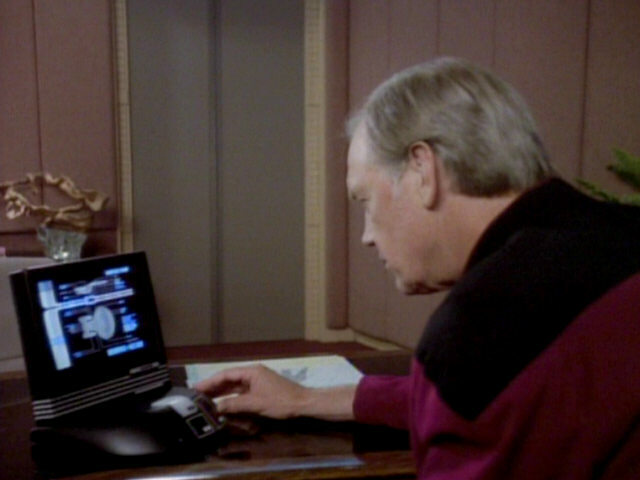 Jellico's desktop monitor displays the same graphic of the USS Enterprise-D also seen earlier in the observation lounge. 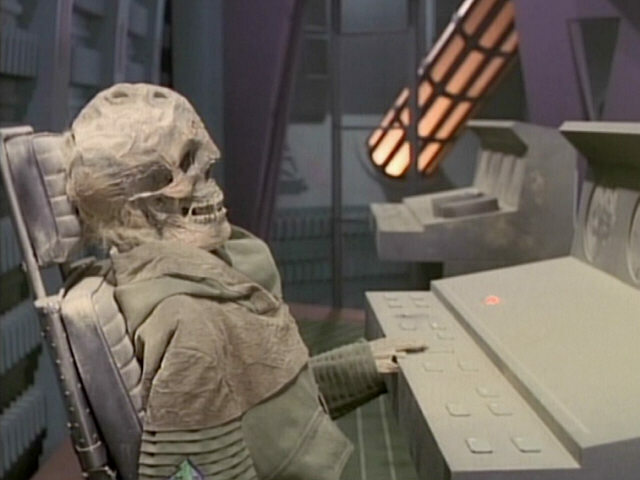 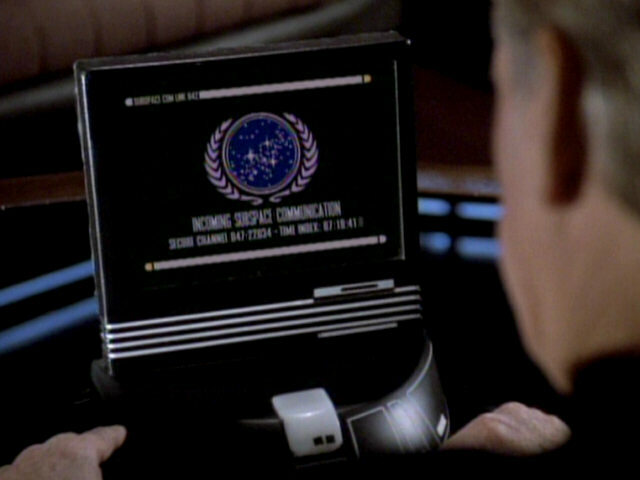 The same graphic was on display in the ready room desktop monitor in several earlier episodes, including "I, Borg". 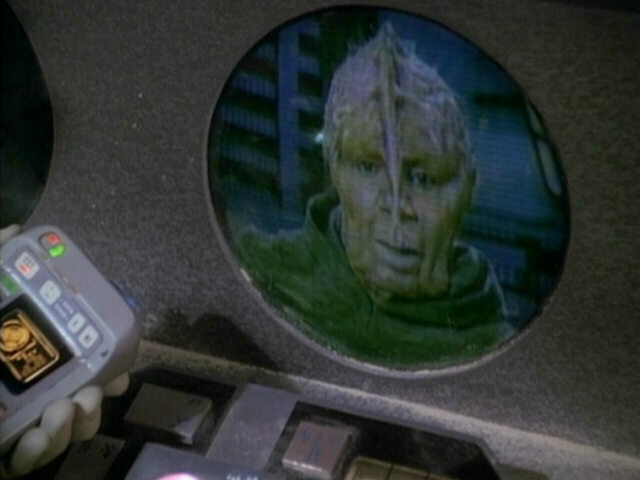 "I, Borg" We can recognize a few more details in HD. 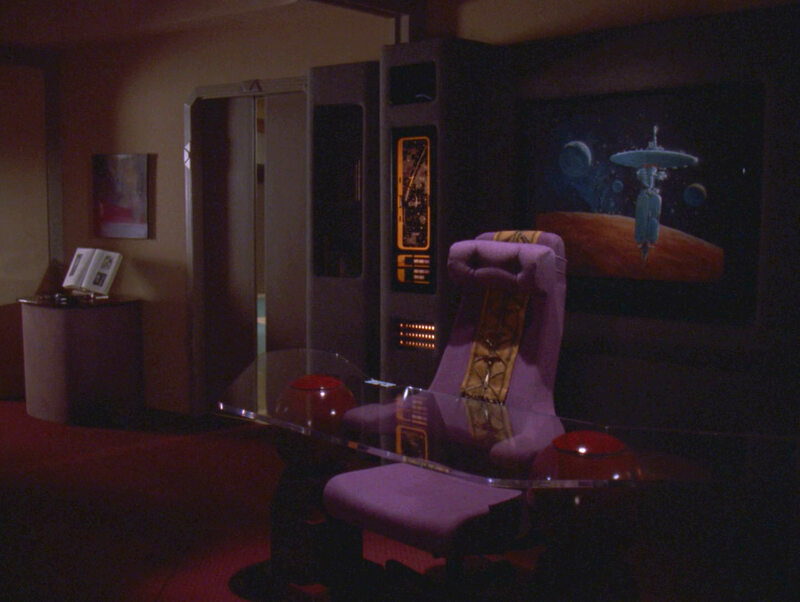 Picard's starbase painting and his Mintakan tapestry can be nicely seen in this screenshot of his quarters. 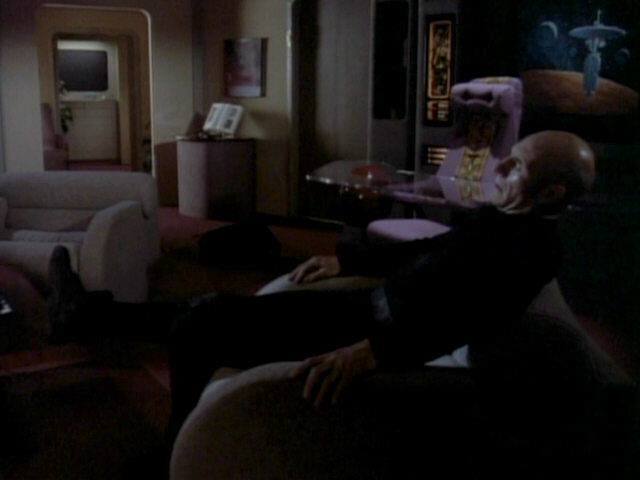 Picard's quarters in HD. 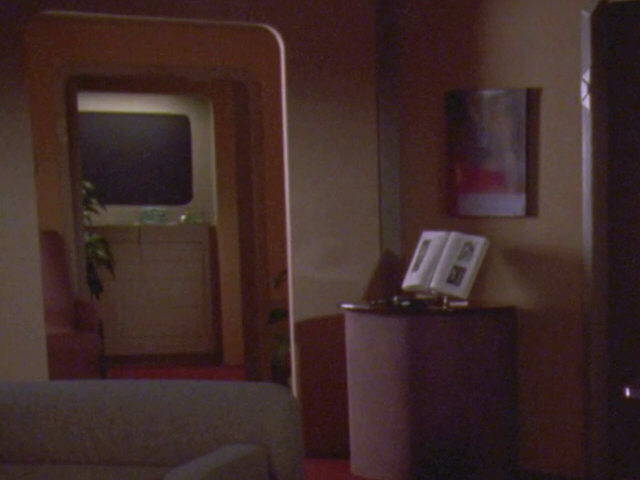 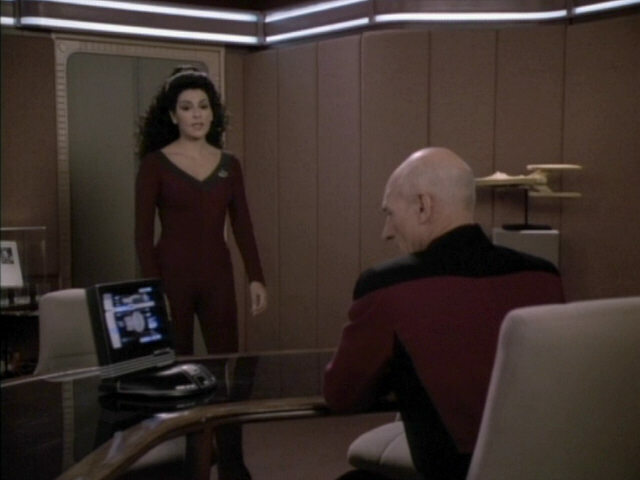 Like in Troi's and Riker's quarters earlier in the season, the mirror in Picard's quarters is covered with a flat black material. 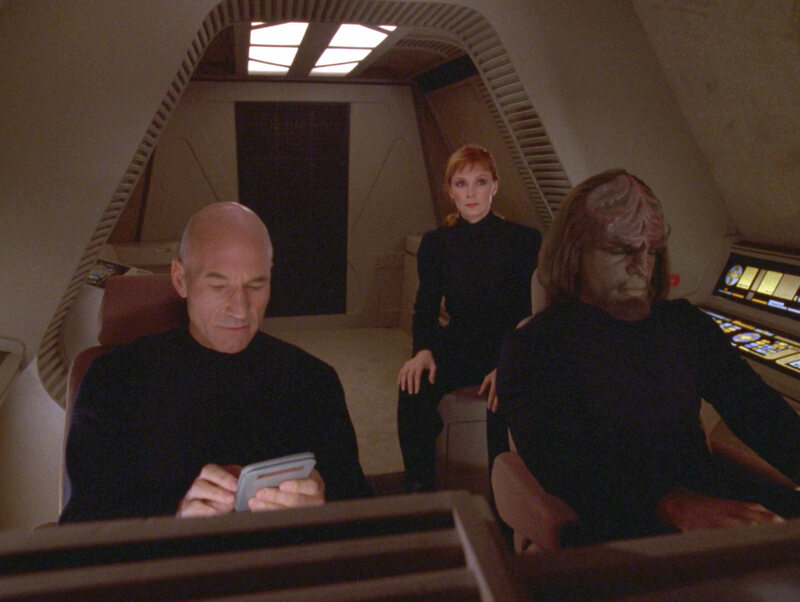 The mirror is still black in HD. 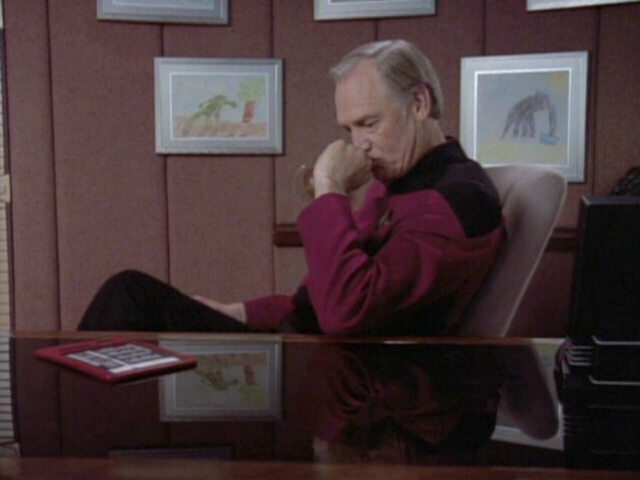 Like Picard, Jellico displays a model starship in the ready room. 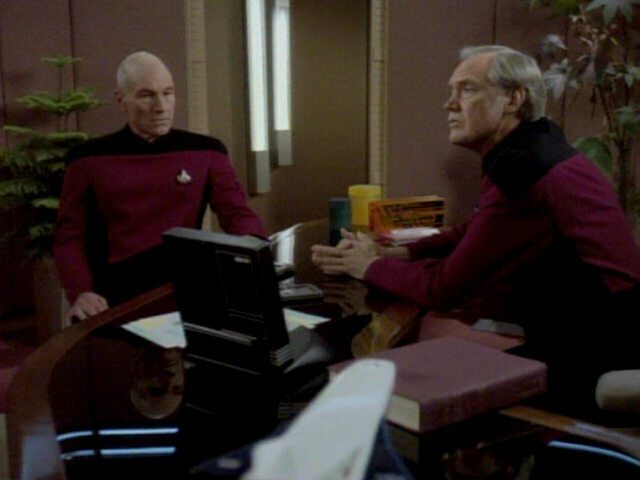 A model of a Rockwell X-30 can be seen in the foreground of this screenshot, in front of Picard's Annotated Shakespeare. 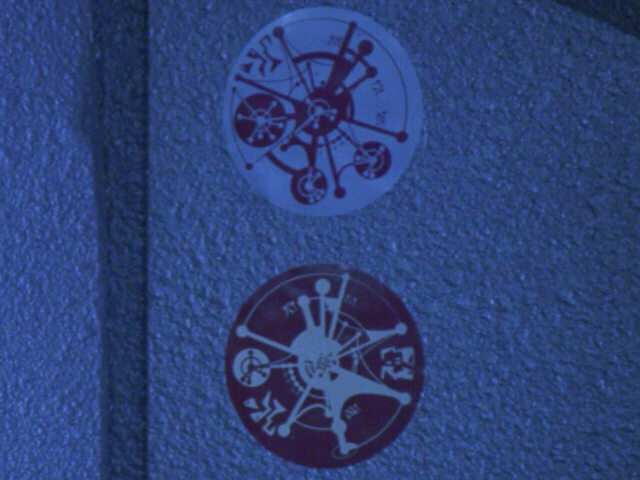 A better look at Jellico's decoration in HD. 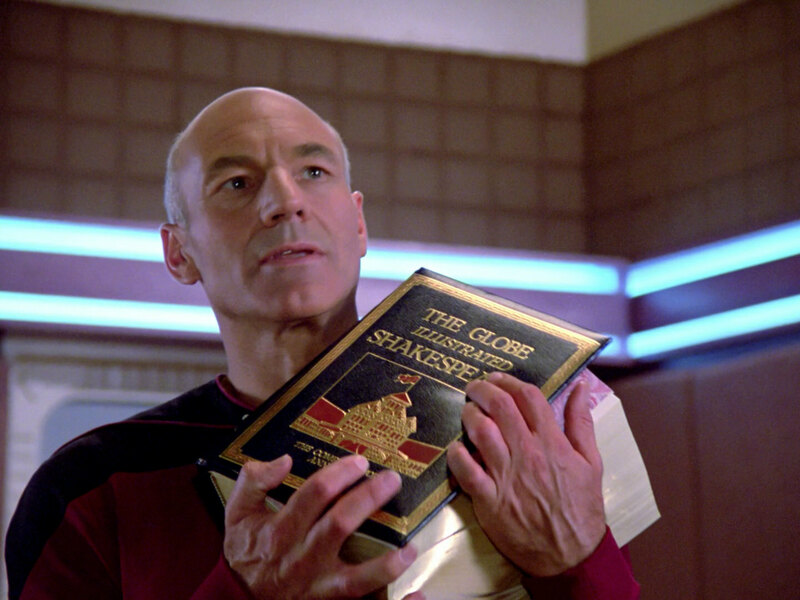 The book handed to Picard by Jellico (The Annotated Shakespeare) is definitely different from the book thrown from Q to Picard (The Globe Illustrated Shakespeare) in "Hide and Q". 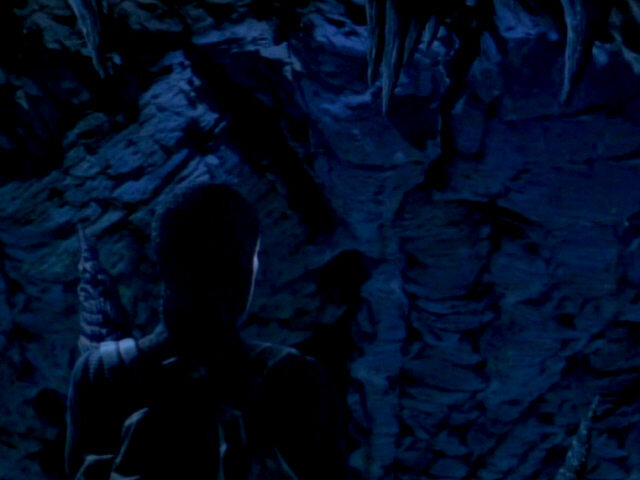 "Hide and Q" HD The book in HD. 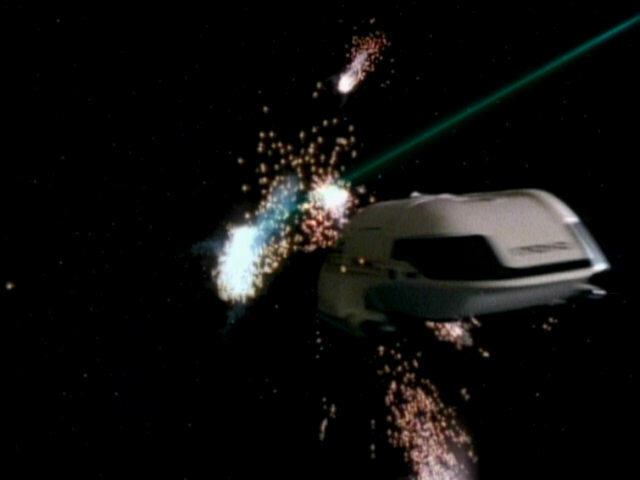 The footage of the shuttle departing the shuttlebay first appeared in the season 2 episode "Unnatural Selection". 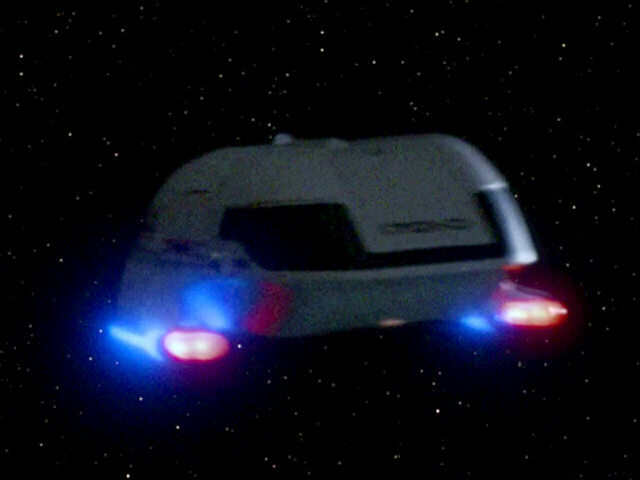 It clearly shows a Type-7 shuttle. 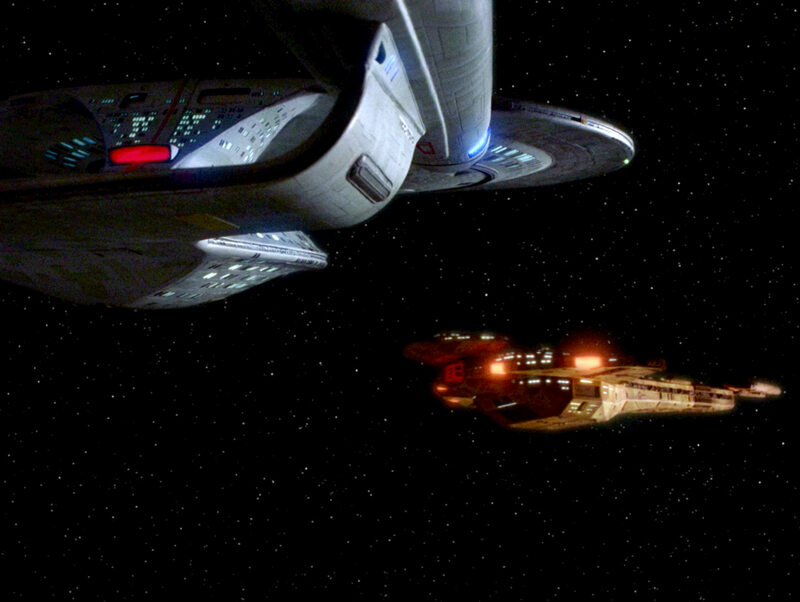 Variations of the Type-7 Shuttle The departure of the shuttle in HD. 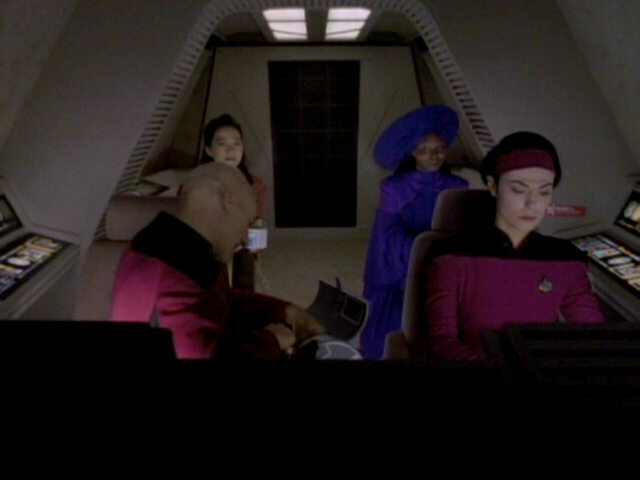 The interior of the shuttle clearly shows a Type-6 shuttle. After the new Type-6 shuttle (interior and exterior) was introduced at the beginning of season 5, the old Type-7 shuttle set was struck. 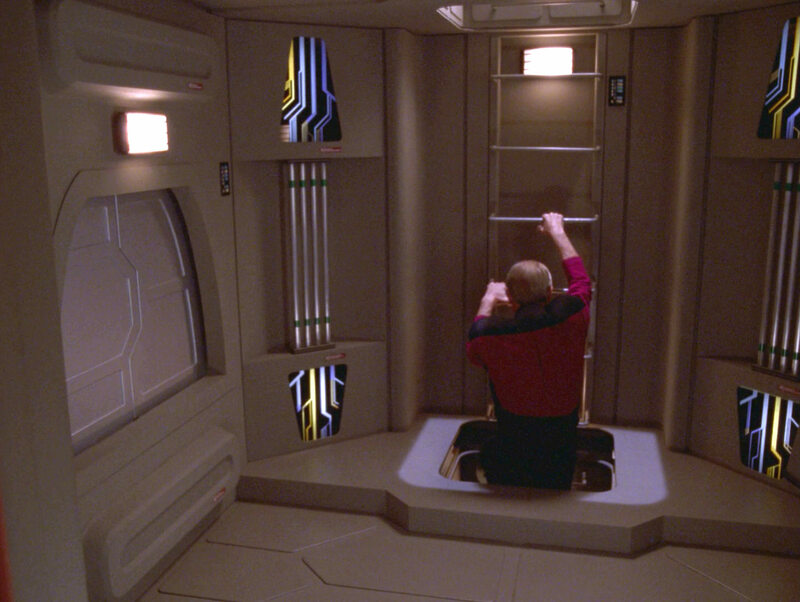 "Rascals" The interior of the shuttle in HD. 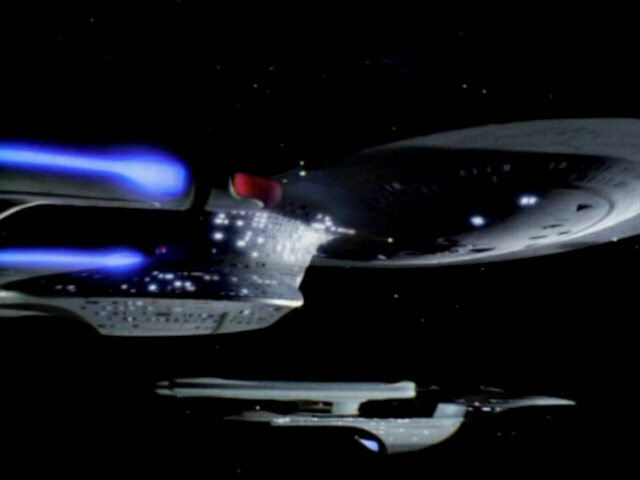 This shot of the shuttle (clearly Type 7) was originally created for "The Best of Both Worlds II". 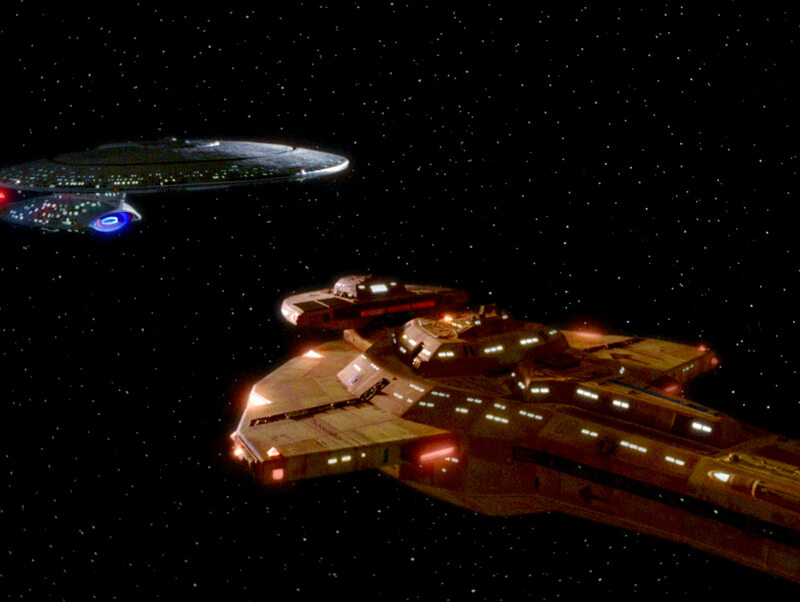 Both Worlds II" The shuttle in HD. 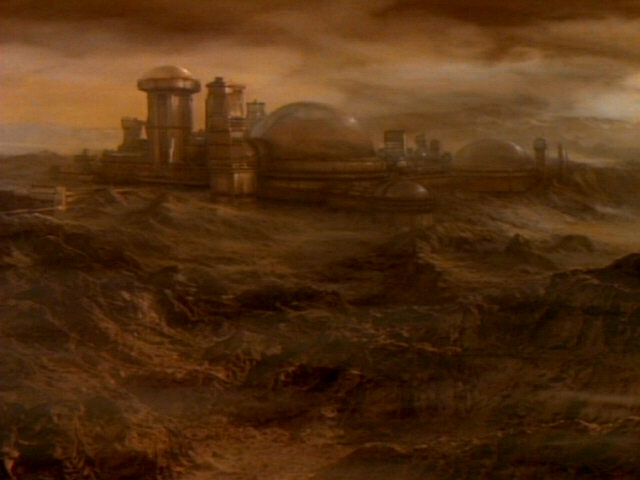 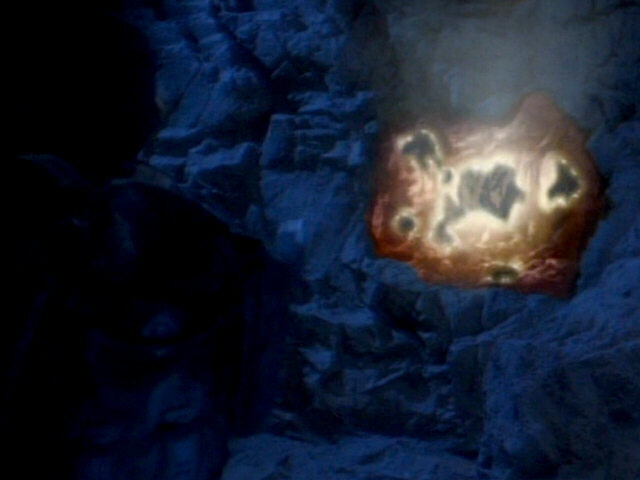 The matte painting showing the surface of Torman V was originally created for "The Masterpiece Society", where it depicted the genome colony on Moab IV. 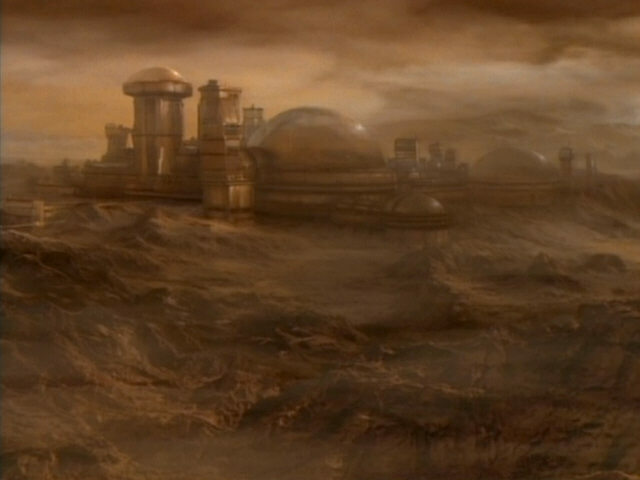 Society" The matte painting is still the same as in "The Masterpiece Society" even in the remastered episodes, with the same enhancements especially in the foreground. 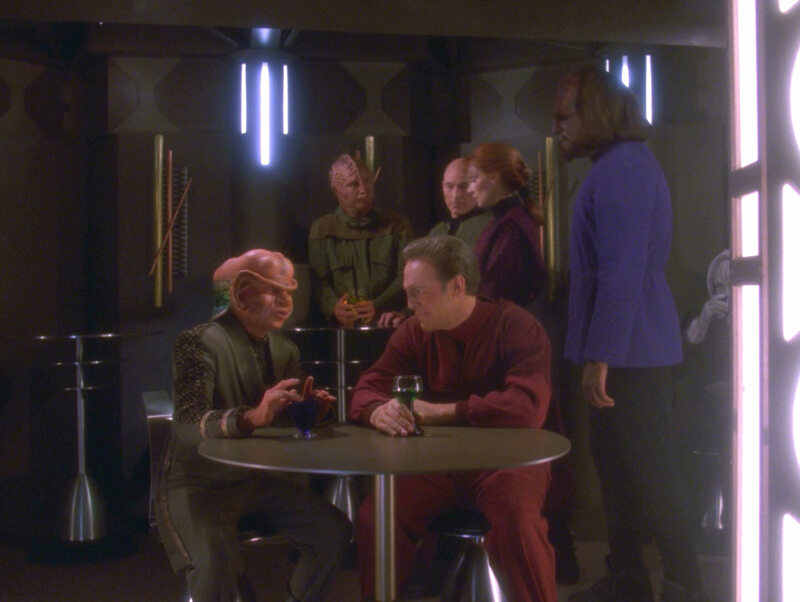 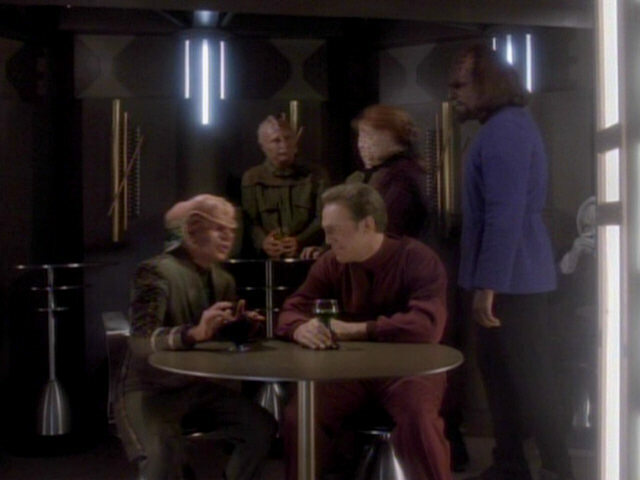 The Torman V bar is a redress of Deep Space 9's replimat, as can be seen in the comparison screenshots. 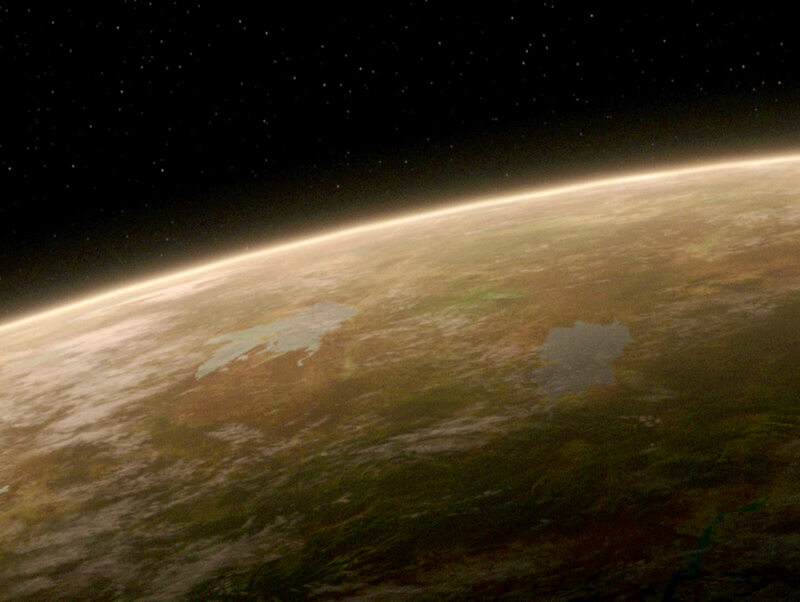 Skin" The bar in HD. 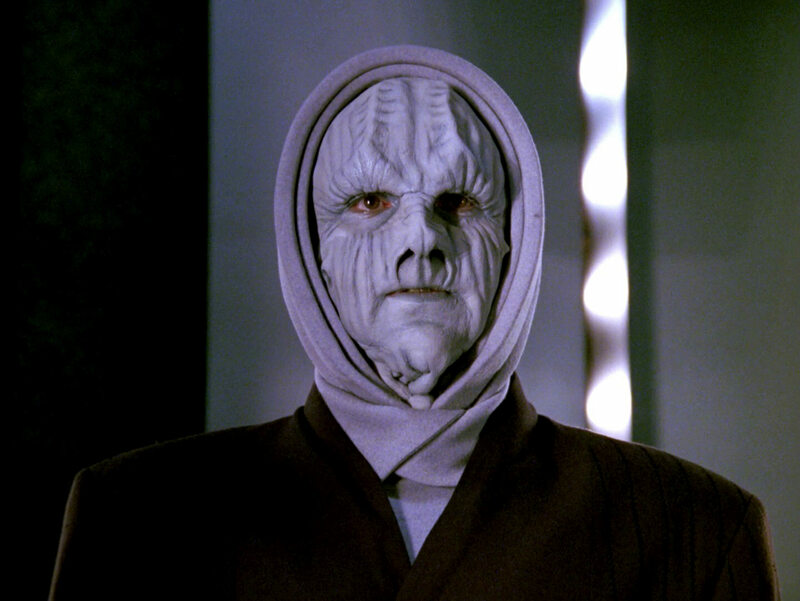 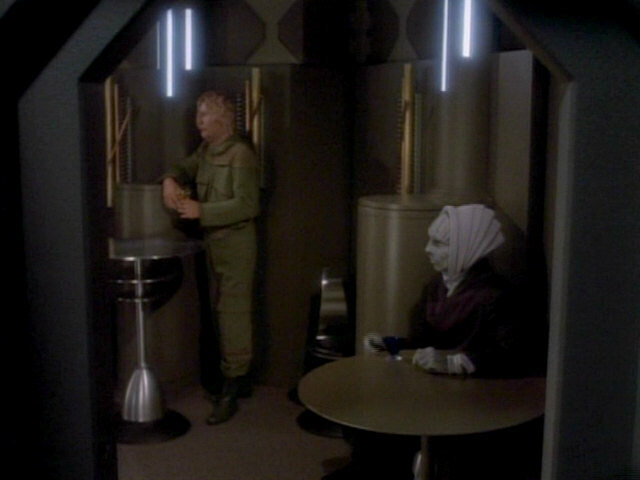 One of the aliens is a Mizarian, earlier seen in "Allegiance" and "Ménage à Troi". 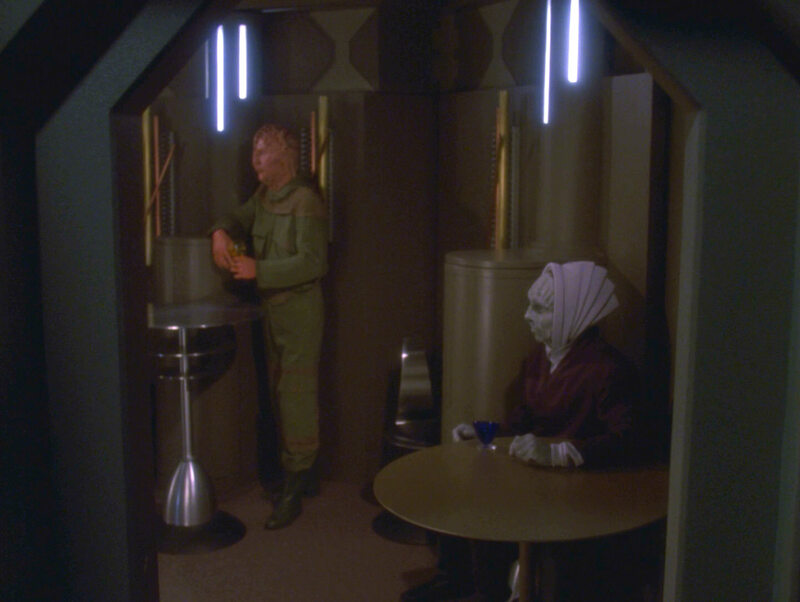 The other alien wears a Promellian uniform and make-up, first seen in "Booby Trap". 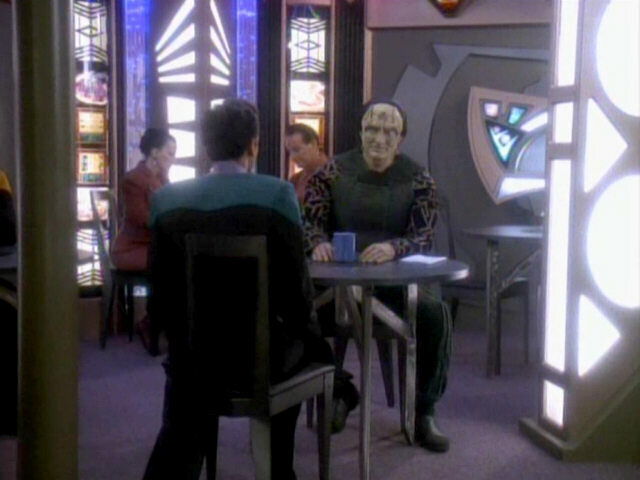 The wall decoration has been seen several times before, most notably in the hearing room in "The First Duty". 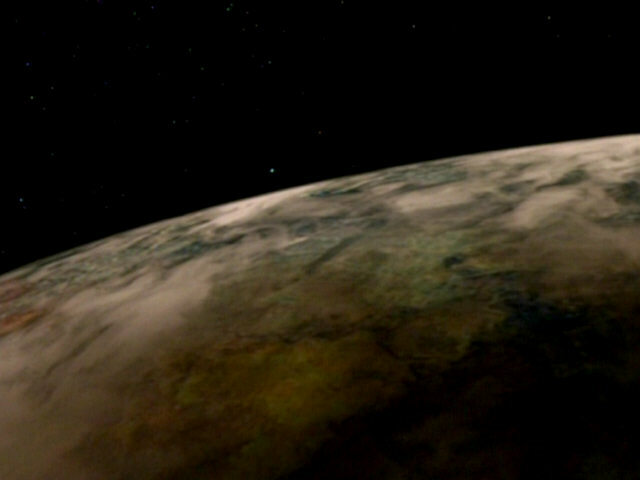 Celtris III appears in only this one shot in the episode. The planet is a new one in TNG-R.
A lynar, a Celtran bat, can be seen in the top half of this screenshot. 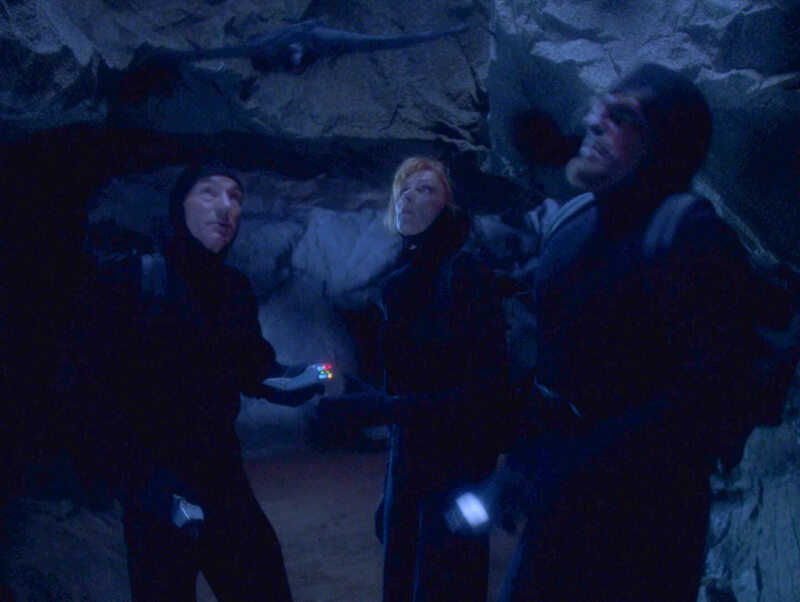 The bat can be seen better in HD. 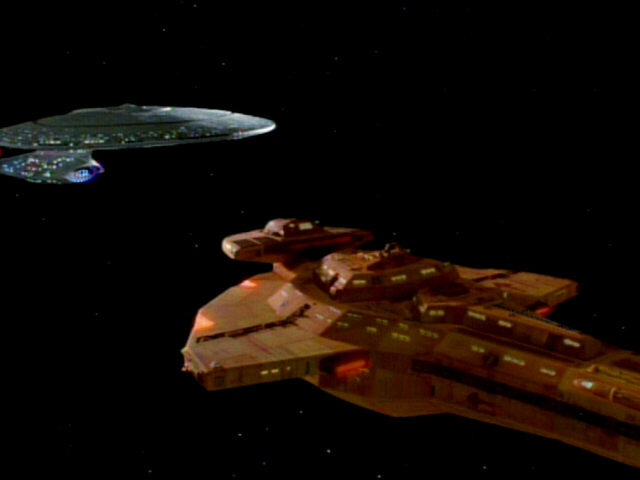 This shot of a Cardassian Galor class ship facing the USS Enterprise-D was originally created for "Ensign Ro". In that episode, the Starfleet dealt with two Cardassian ships. 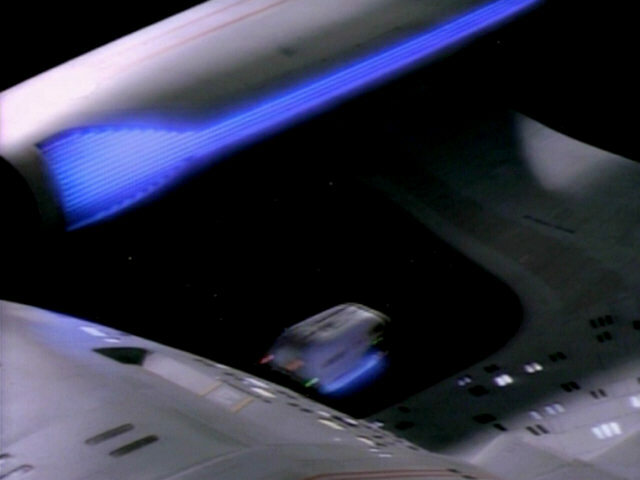 "Ensign Ro" The space sequence in HD. 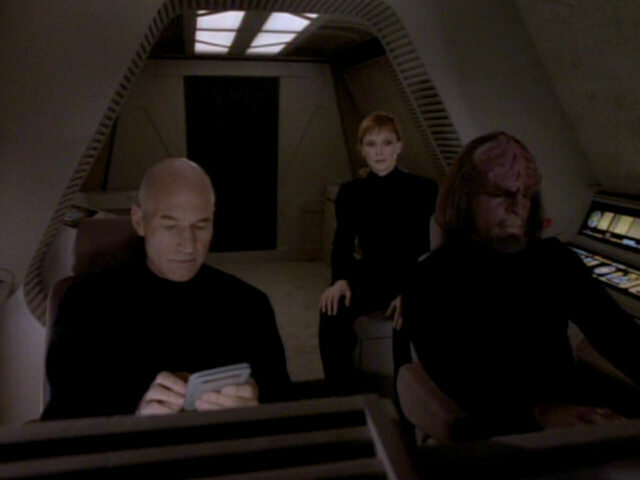 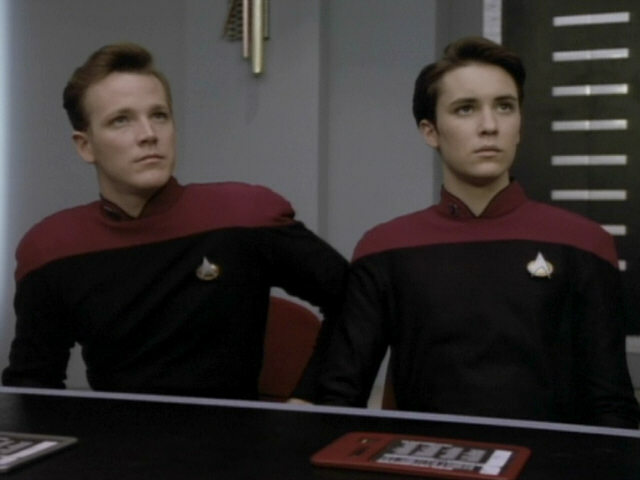 The red PADD with a very simple black and white LCARS interface was originally created for "The First Duty". 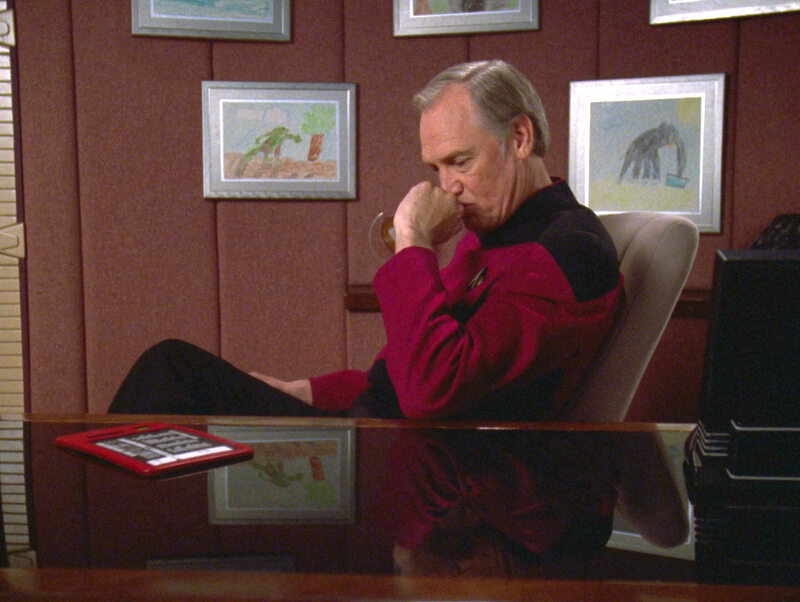 "The First Duty" The red PADD and Jellico's decoration in HD. 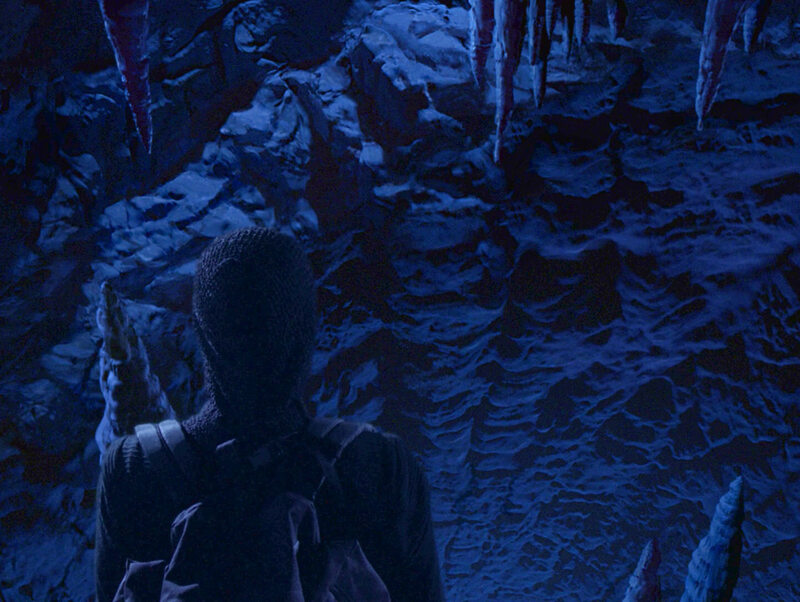 The caves of Celtris III were digitally extended with two matte paintings seen in these two screenshots. 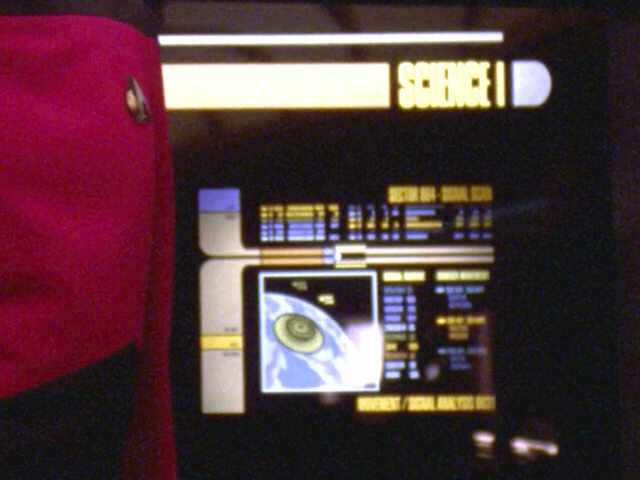 The background was heavily edited or created from scratch for TNG-R.
From this episode on, the second observation lounge viewscreen displays a Starfleet Operations graphic, listing Federation ship activities in Sectors 21166 to 23079. 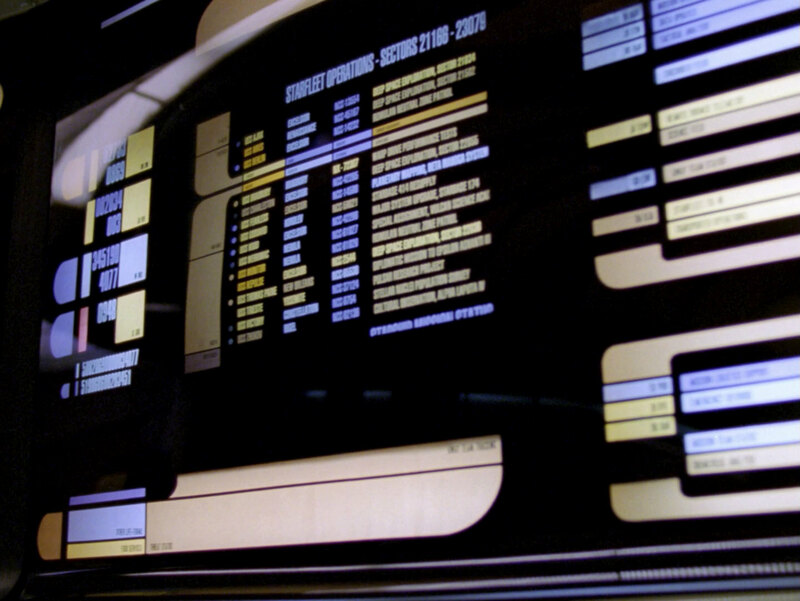 A similar list was first displayed on a bridge monitor in "Brothers". 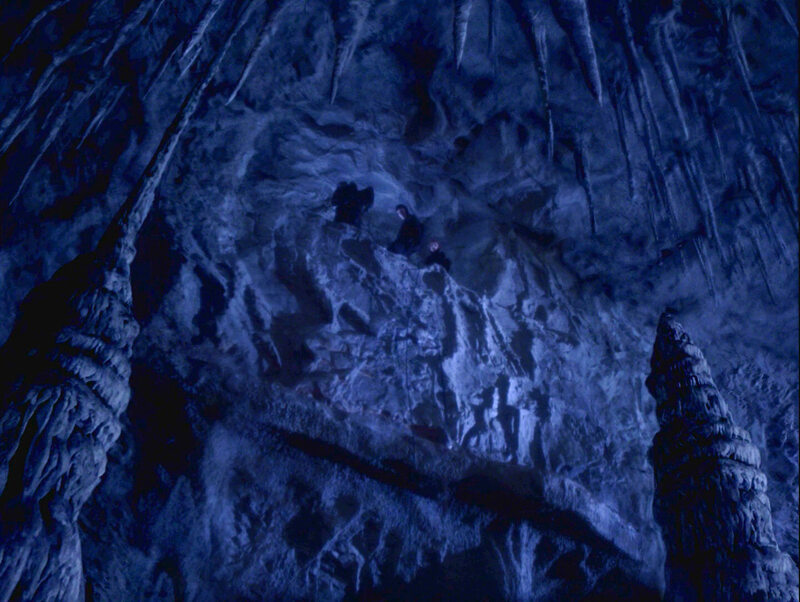 "Brothers" HD A better look at the display in HD. 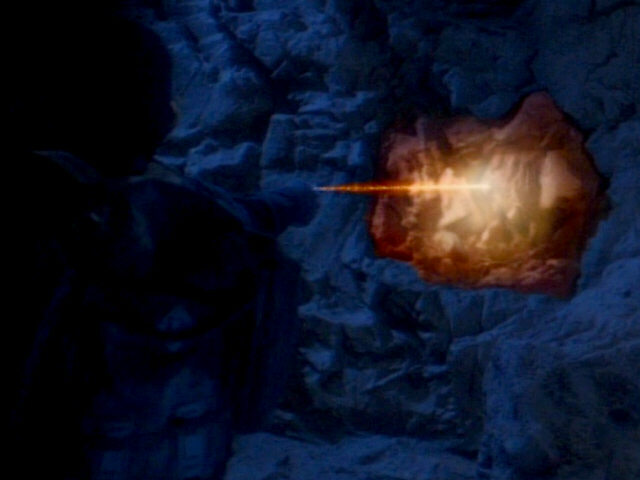 A cave wall is vaporized with a phaser in these two screenshots. 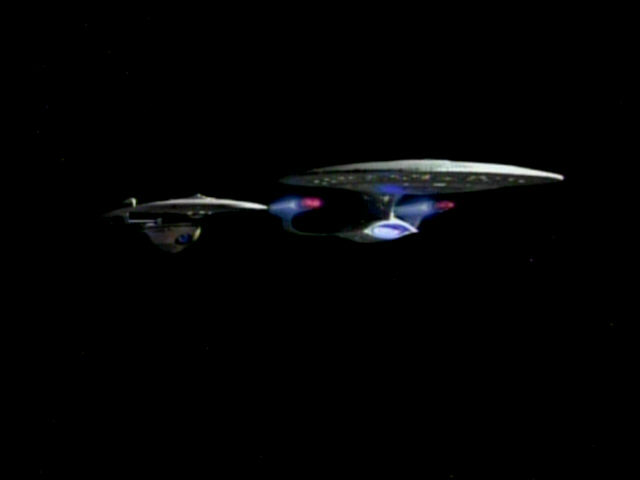 The reconstructed effect in HD. 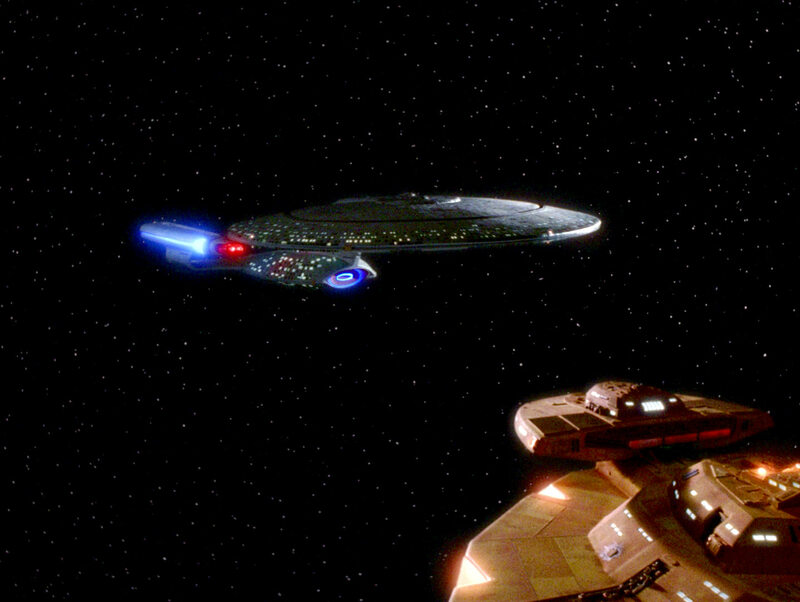 This is another re-used shot of the USS Enterprise-D and a Cardassian Galor class ship. 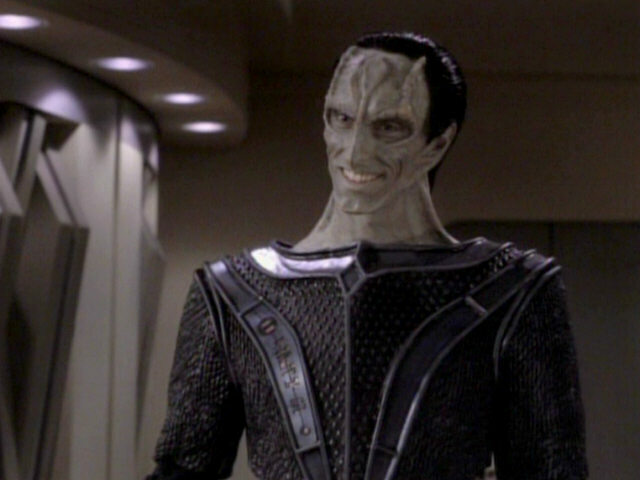 This time, the shot was created for the first episode featuring the Cardassians, "The Wounded". 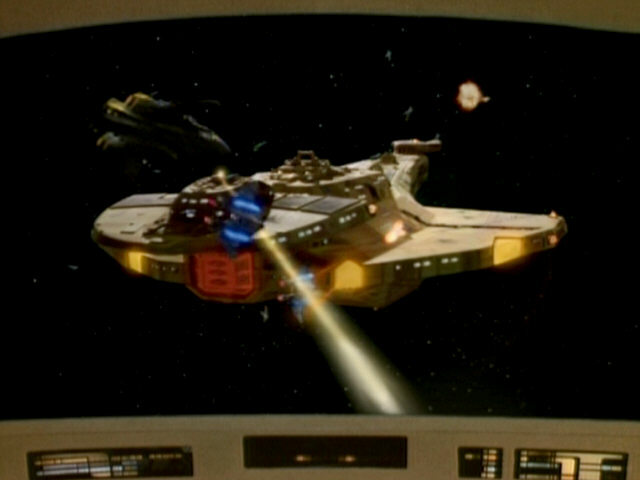 In that episode, the deflector of the Cardassian ship was still glowing yellow as opposed to the red glow it shows here. 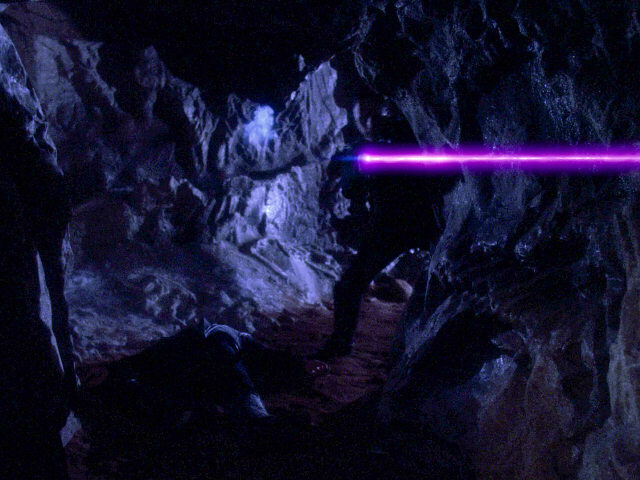 "The Wounded" The space shot in HD. 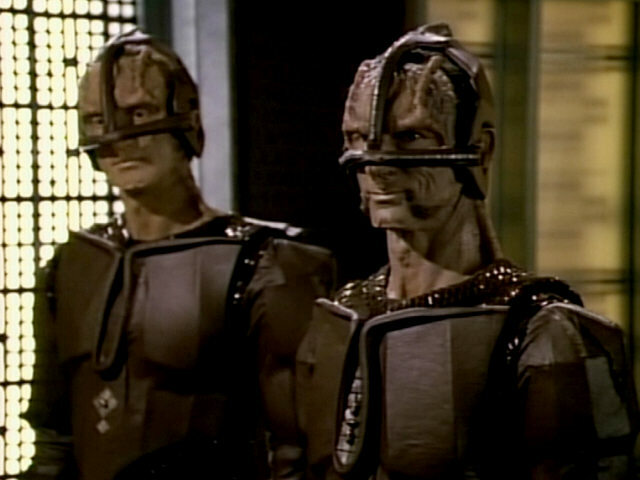 The newly designed Cardassian uniform debuts in this episode. 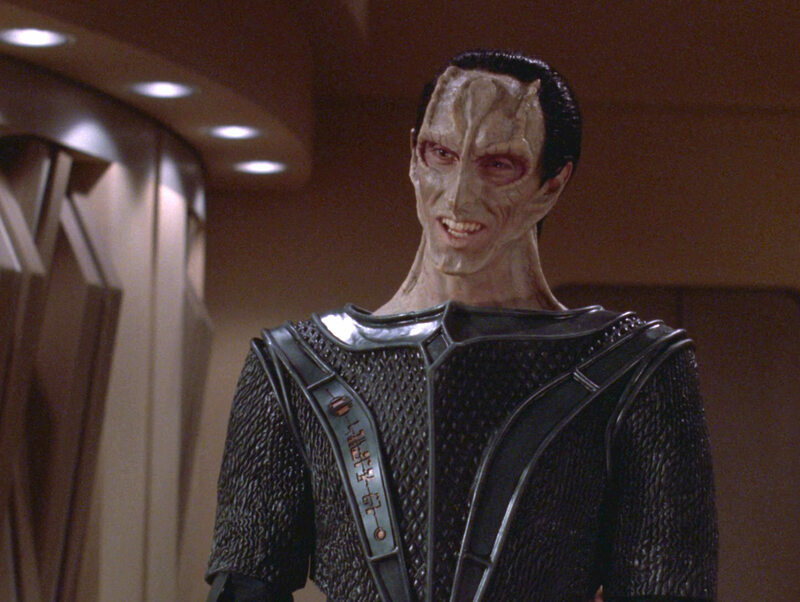 The dark uniform with delicate Cardassian writing is a clear departure from the padded suits seen in "The Wounded" and "Ensign Ro". 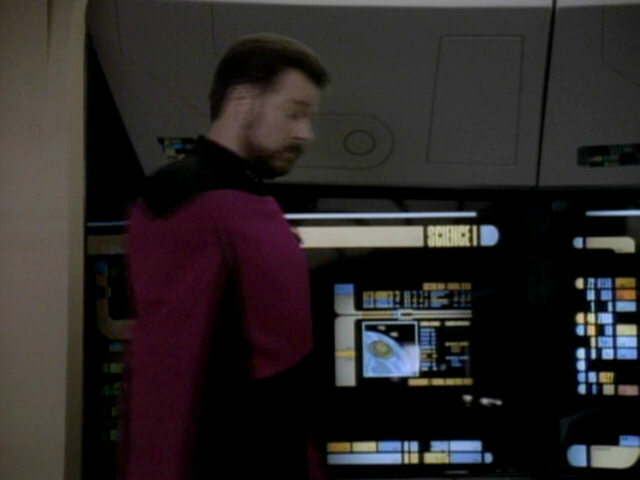 "The Wounded" The new Cradassian uniform in HD. 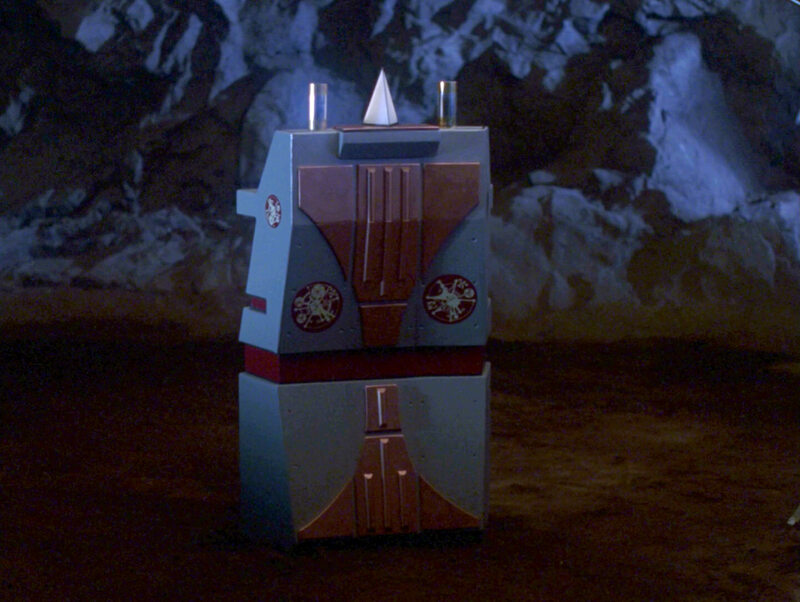 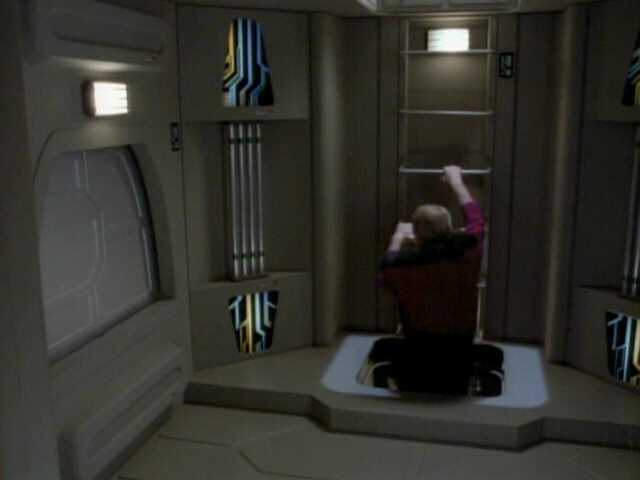 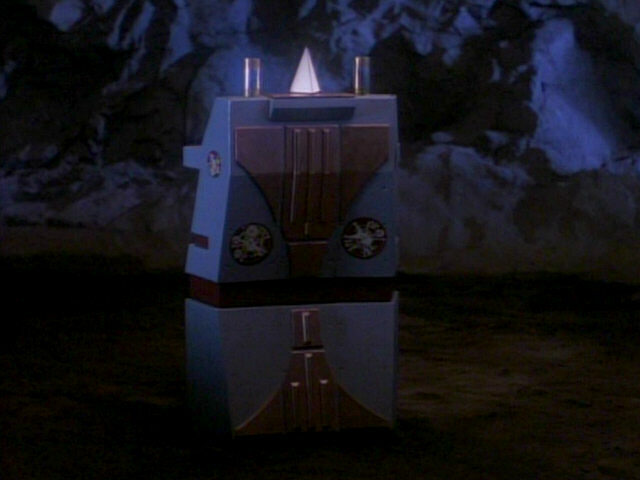 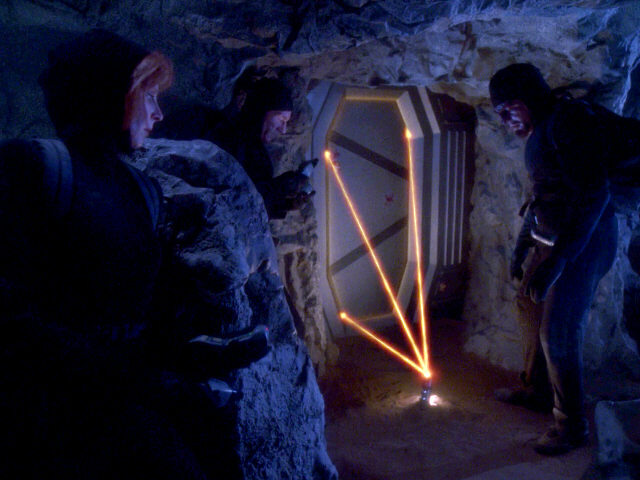 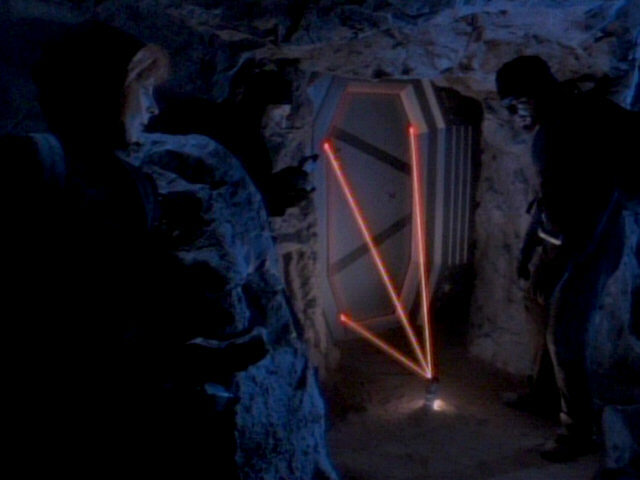 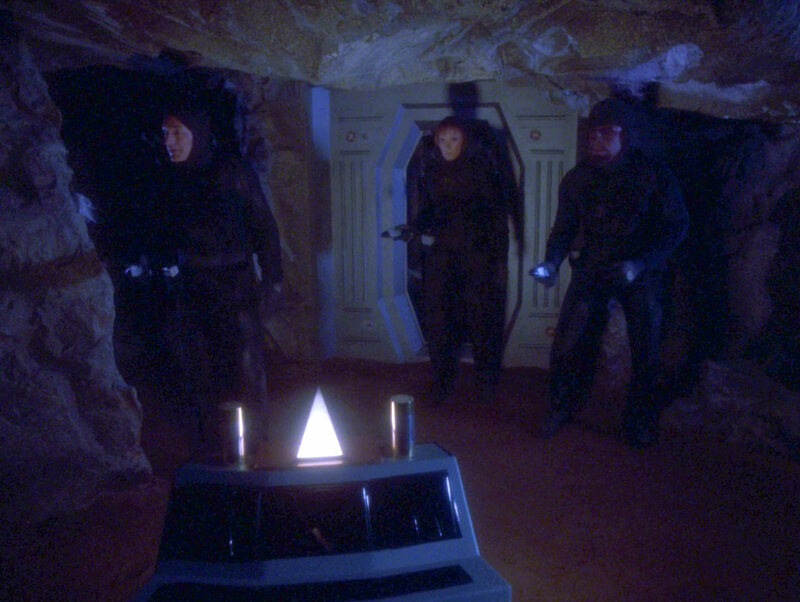 A sensor echo generator helps Worf, Picard and Crusher to bypass the lock of the Cardassian doorway. 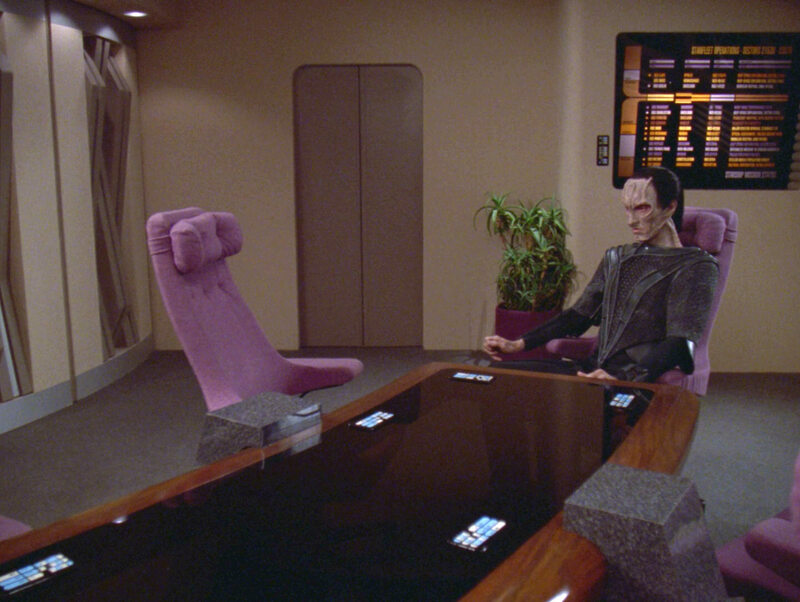 The reconstructed effect in TNG-R.
Two Cardassian labels (nicknamed "squashed bugs") can be briefly seen in this shot. Labels of this kind were often seen on Cardassian consoles and walls in DS9. 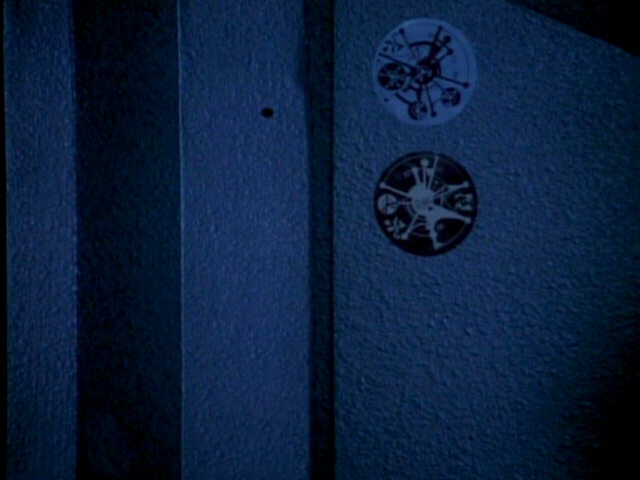 A close-up of the two labels in HD. 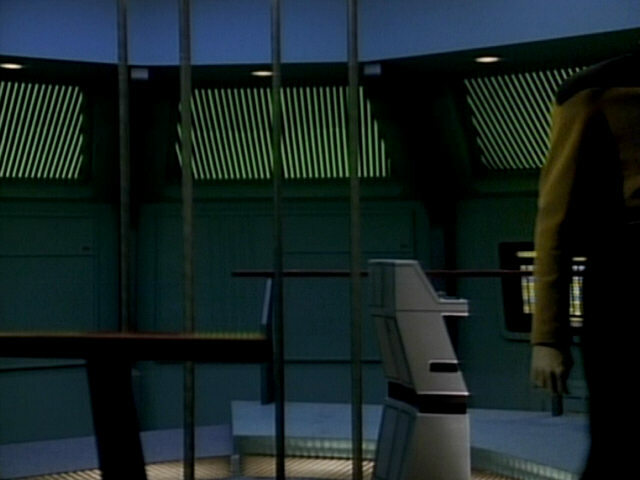 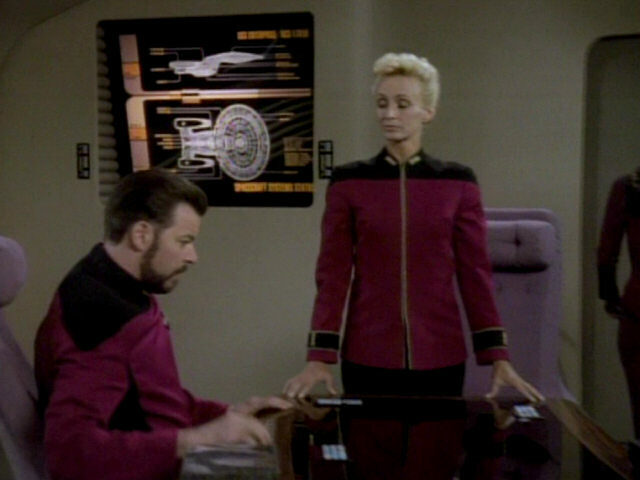 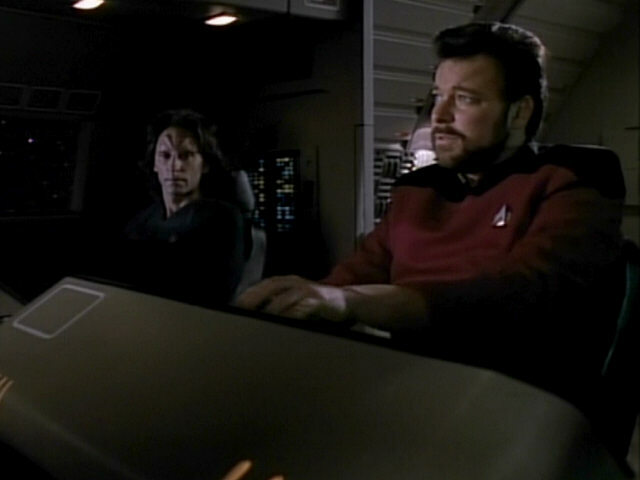 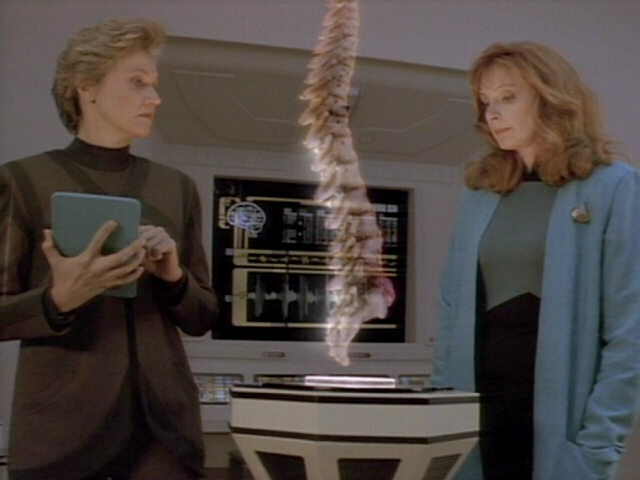 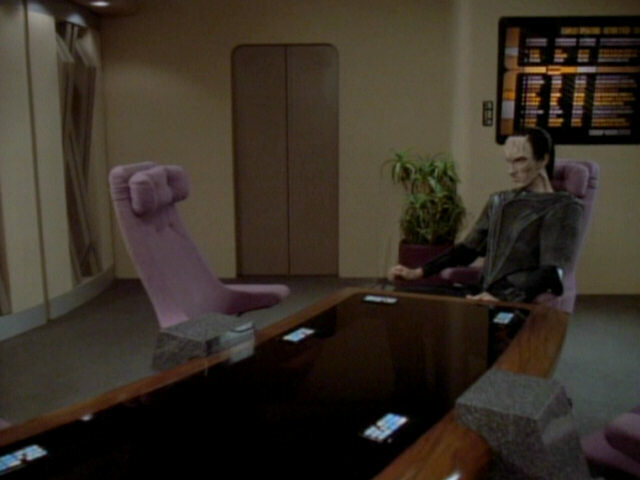 The Cardassian console seen in this scene was originally created as a Federation console usually seen in the medical/science lab in episodes such as "The Offspring" and "Transfigurations". 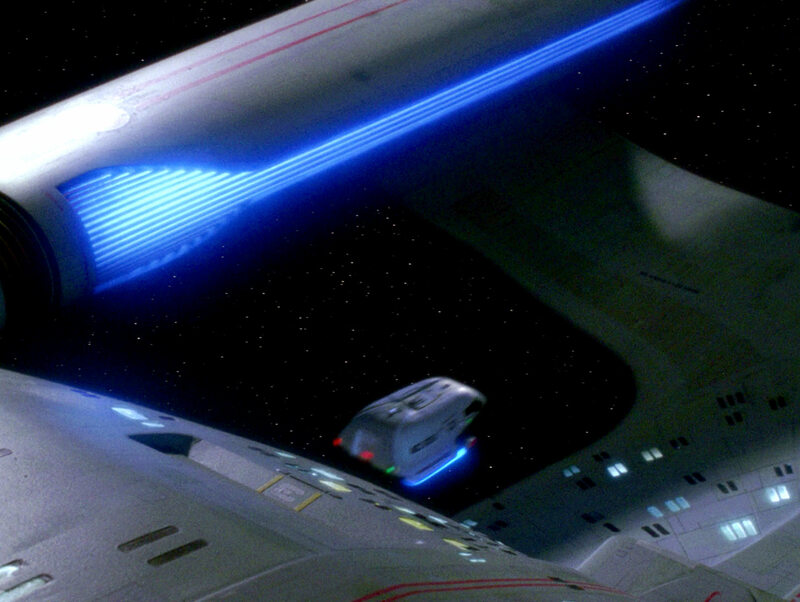 "The Offspring" The console in HD. 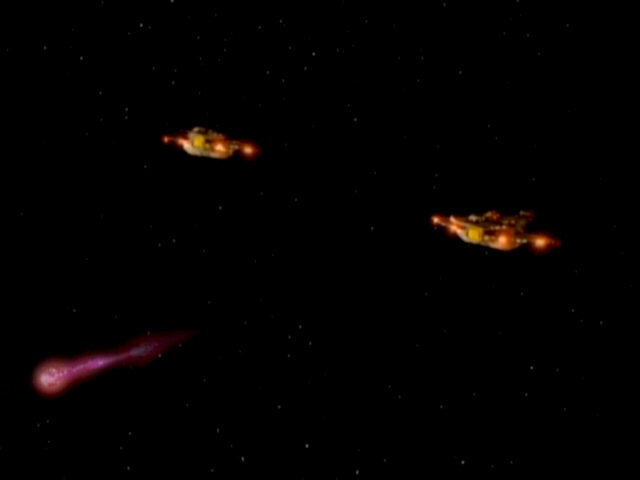 Cardassian hand-held disruptors fire a pink/purple beam in this episode, similar to all scenes showing Cardassian Galor-class ships firing their shipboard disruptors in earlier episodes. 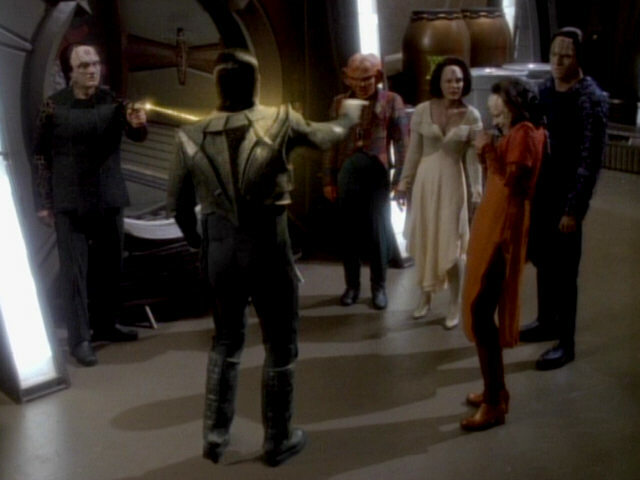 In later seasons, Cardassian disruptors were universally seen firing an orange/yellow beam. 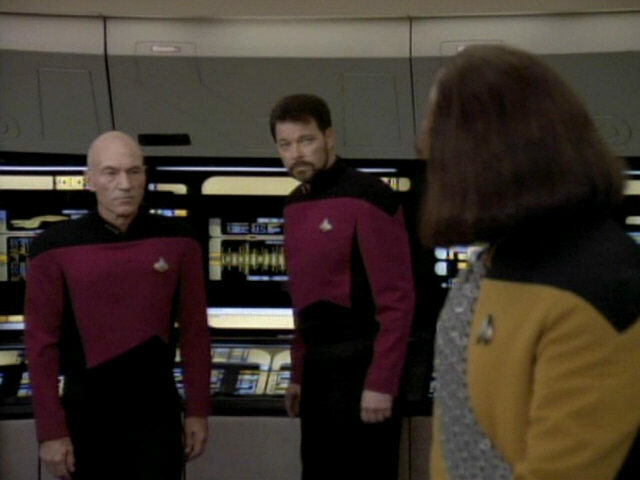 and Loss" The reconstructed effect in TNG-R. 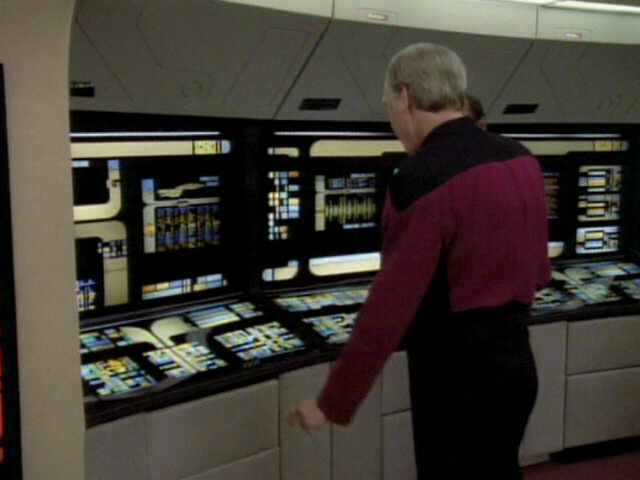 This bridge monitor displays a graphic of Celtris III. 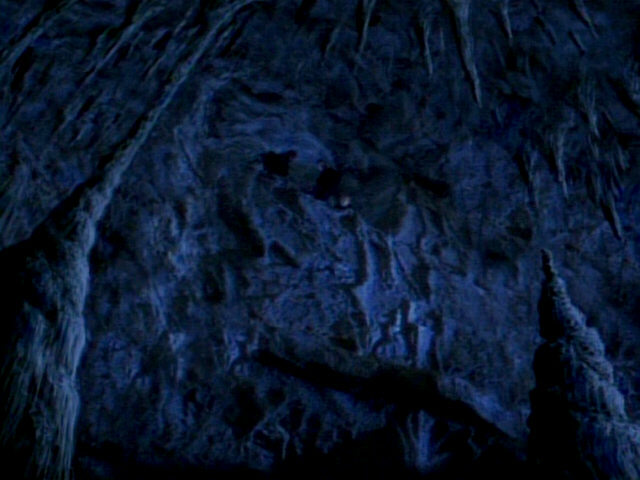 A close-up of the graphic in HD. 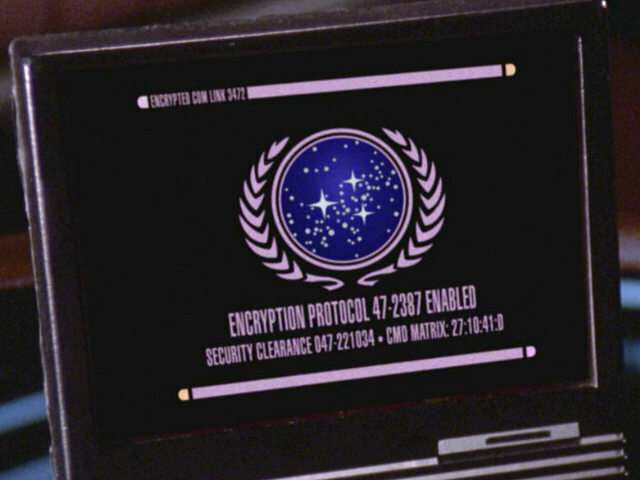 This animated graphic of the ready room desktop monitor shows the decryption protocol in action. The reconstructed animation in HD.